It is a great pleasure for me to attend today’s special event to commemorate the International Day against Drug Abuse and Illicit Trafficking and to launch the 2015 World Drug Report as yet another excellent overview of recent developments and trends with regard to the world drug problem. I would like to thank the United Nations Office for Drugs and Crime and the Commission for Narcotic Drugs for the invitation extended to me and for the opportunity to speak in this important gathering. Today is an important day for reminding ourselves of the dangers and threats that the world drug problem poses to development, well being, security and stability of our societies. Since 2005, the Government of Afghanistan has commemorated this international day conveying to the public the negative impact of this menace on the society. Illicit drug remains one of the biggest challenges to Afghanistan, the region and the world at large which requires our collective actions based on the principle of shared responsibility. Afghanistan remains a prime victim of this menace. Along with factors such as insecurity, poverty and unemployment which motivate cultivation in some provinces, drug trafficker networkscontinue to encourage farmers including through advance purchase of opium poppy. Additionally, the growing links between narcotics, terrorism, money laundering and other forms of transnational organized crimerequires comprehensive . Parallel to an increase in poppy cultivation in Afghanistan over the past few years, we have also witnessed deteriorating securitysituation in areas under cultivation which is an indication of clear link between cultivation and insecurity. In accordance with the survey conducted by the Ministry of Counter Narcotics of Afghanistan with support from the UNODC in 2014, out of 132 districts in the country where poppy cultivation takes place, 41 districts are responsible for 94% of cultivation, out which, 10 districts cultivate 54% of poppy in the country. The survey also shows that around 90% of cultivation happens in the insecure areas in the south and south west of the country. Our main focus in the next few years will therefore be on these 10 districts. . The National Unity Government of Afghanistan is committed to the elimination of opium economy including through development and implementation of new programs and initiatives and the revision of the current laws and strategies under an integrated approach. Under the vision of the National Unity Government of Afghanistan, the Ministry of Counter Narcotics has just recently presented its first 100-day work planunder the new leadership aiming at 1) further development of counter narcotics strategies and policies, 2) strengthening coordination and cooperation among all agencies and ministries involved in counter narcotics efforts, 3) improving the capacityof the Ministry in implementing its relevant programs and projects, and 4) encouraging greater support by the international community in the area of counter narcotics. .
During the first month of the work plan, the Ministry has made considerable achievements in areas such as the review and revision of the National Drug Control Strategy, preparing the draft amendment to the Counter Narcotics Law of Afghanistan, development of Counter Narcotics District-Based National Program, development of gender policy and public awareness strategy, development of oversight and evaluation mechanism for counter narcotics programs, improving coordination and oversight for alternative development programs, implementation of alternative livelihood projects that have direct impact on farmers’ livelihood, collecting homeless addicts, launching of the Afghanistan Drug Reporting System with support from the UNODC, conducting various surveys and capacity building programs. The work is also underway to further incorporate the counter narcotics goals in the programs of the line ministries. We are working closely with the Ministry of Public Health of Afghanistan to mainstream the drug demand reduction into the two public health packages: The Essential Public Health System (EPHS) and The Basic Public Health System (BPHS). This will help us use the capacity of some 2000 hospitals and clinics with 40000 health employees to deliver drug treatment services. This is of highly importance for us given the recent worrying increase in the number of addicts in the country and equally important will be greater international support to these two public health packages. We are also trying to academically institutionalize Drug Demand Reduction in the Higher Education System in Afghanistan starting with the inclusion of a demand reduction course in the curriculum of some of the faculties including the faculty of medical science. As another important initiative, we have aligned the counter narcotics planning with the anti-insurgency military operations and in this context, our focus in the short term will be on poppy eradication and for the longer term, the focus will be to prevent the cultivation of poppy and to maximize the drug seizure rate. At the regional level, we are trying to expand counter narcotics efforts under the Heart of Asia Process. The work has also been underway to develop the Counter Narcotics Regional Strategy aiming at strengthening regional cooperation in support of counter narcotics efforts in the region. In ten months, we will all gather in New York to discuss our way forward in addressing the world drug problem while learning from our past experiences and building on our achievements in the past. Taking this opportunity, I would like to thank the Commission on Narcotic Drugs and the Board tasked with UNGASS preparations for facilitating the preparatory process including the provision of opportunities for discussing the priority areas that need to be addressed during the Special Session in 2016. We are glad to see that Afghanistan will have the opportunity to represent the Asian Group as the First-Vice chair of the Board. 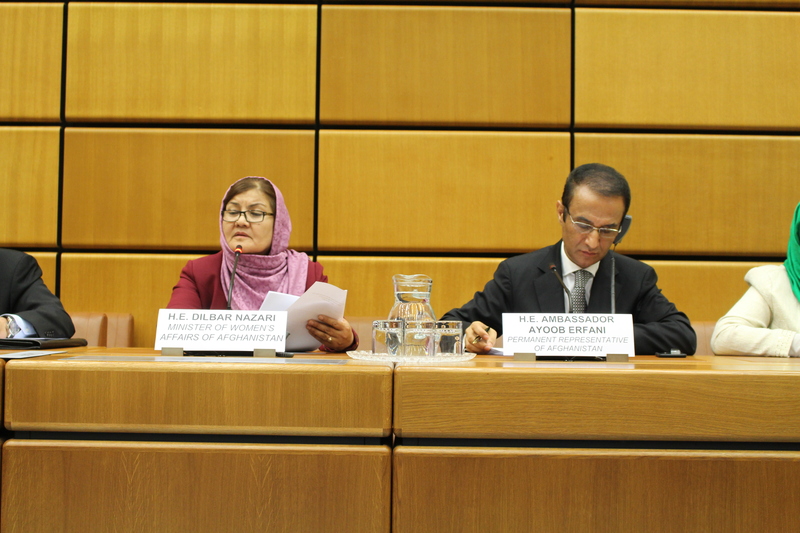 I hope that UNGASS 2016 will serve as an opportunity to not only discuss ways to expedite the implementation of the political declaration and plan of action of 2009 but also to focus on the new and emerging challenges, trends and realities on the ground as well as ways to address them under a holistic and balanced approach. Our international partners have provided considerable support to our fight against narcotics over the past years for which we are grateful. The United Nations Office on Drugs and Crime has also been actively supporting our efforts in areas such as survey and research, alternative livelihood projects, demand reduction and addiction treatment. The UNODC role is also crucial in facilitating and coordinating regional and international cooperation in addressing the world drug problem. While we are committed to fighting the menace of narcotics, we will continue to need international support including those under the UNODC. 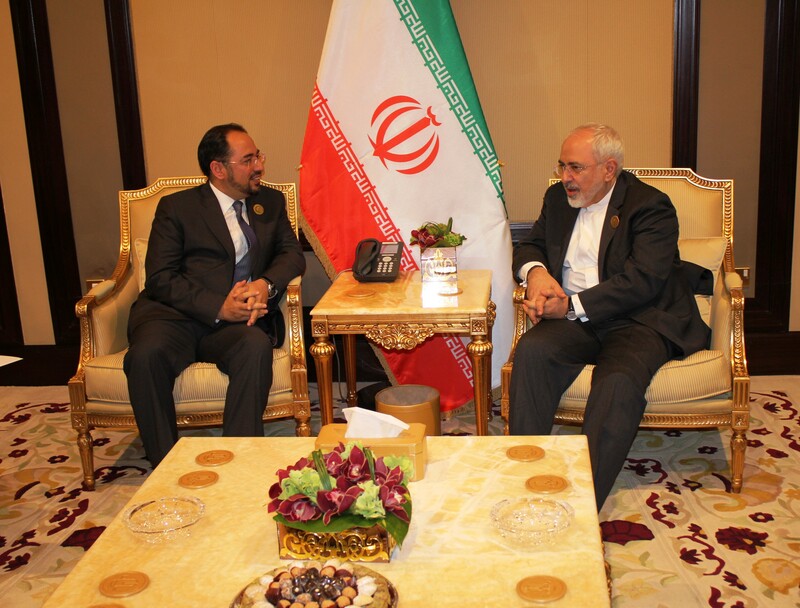 I hope that we will witness greater international assistance to our counter narcotics efforts in the years to come. On 5 June citizens across the planet celebrated World Environment Day. Established by the United Nations in 1972, the day is celebrated yearly to increase global awareness towards the environment and to encourage taking positive actions for its protection. 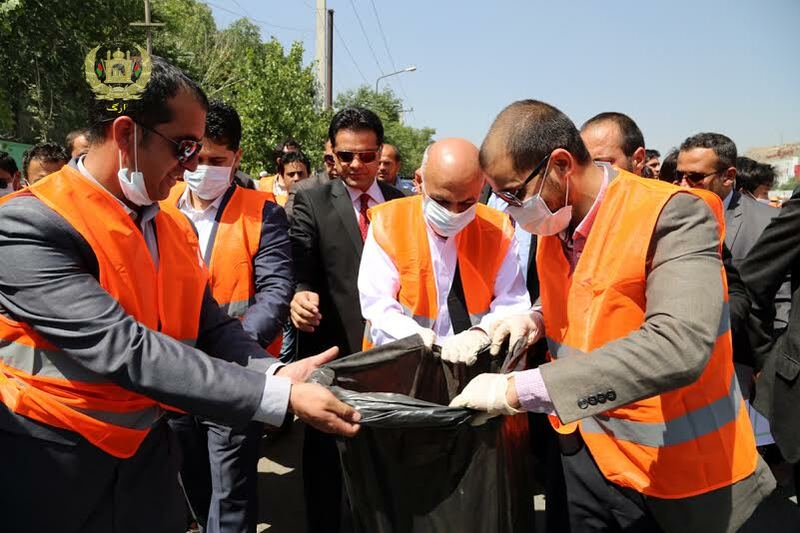 This year, President Mohammad Ashraf Ghani marked the occasion by participating in a cleaning drive in downtown Kabul. Donning an orange uniform, President Ghani worked alongside members of civil society, the youth and other Kabul Municipality employees to clean up the streets. 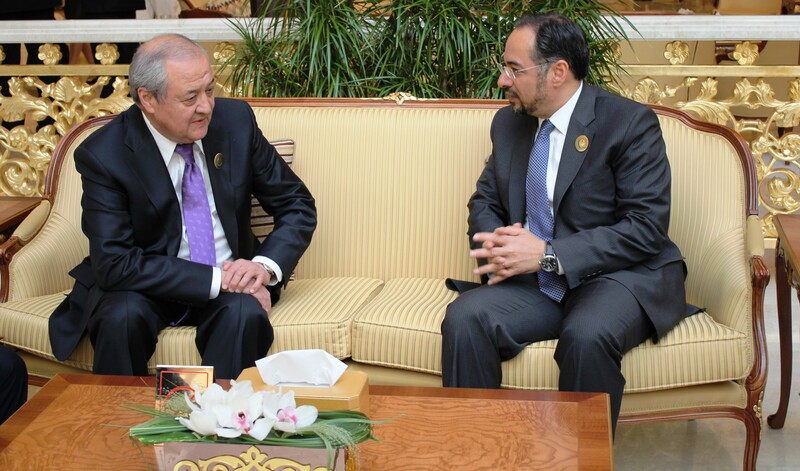 At the margins of the conference, Minister Rabbani met with the Foreign Minister of the United Arab Emirates, H.E. 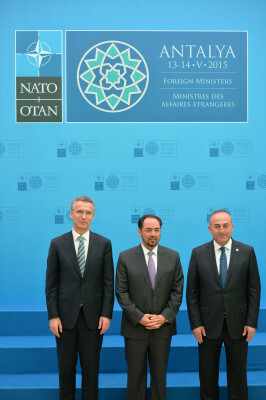 Abdullah Bin Zayed Al Nahyan, as well as with the Foreign Minister of the I.R. of Iran, H.E. Mohammad Jawad Zareef. On Thursday and Friday H.E. 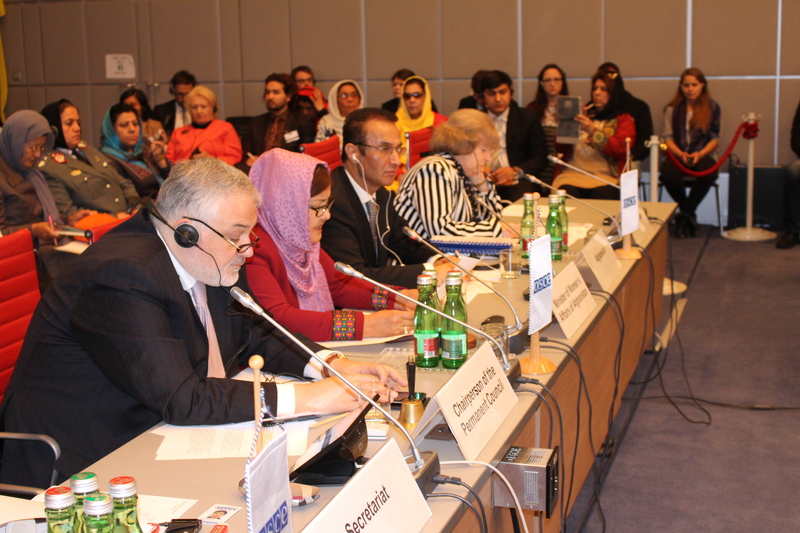 Dilbar Nazari, Minister of Women’s Affairs in Afghanistan, and a visiting women’s delegation attended the OSCE Security Days Event on Promoting Dialogue to Advance Tolerance and Prevent Radicalization. The two day meeting addressed various means available for discouraging radicalization in societies across the world. The event included sessions on the roles of media and education in the matter, the root causes of such issues, and the importance of the participation of women, the youth and religious leaders in fostering inclusive dialogue. Ms. Nazari and her delegation participated in these sessions and expressed their appreciation at being present to discuss issues of such importance to Afghanistan. The country faces several challenges in the area of radicalization and is committed to continuing to addressing such issues, especially through the empowerment of women and their inclusion in the peace and reconciliation process. This afternoon, the Permanent Mission of Afghanistan and the OSCE Gender Section co-organized a Roundtable on Gender-Responsive National Reconciliation in Afghanistan. The roundtable emphasized that women’s empowerment remains a key objective of the post-2014 agenda and that women’s increased participation in governance is vital tool for achieving stability and security. H.E. Ambassador Erfani made opening remarks on the occasion, highlighting the fact that with women constituting 50% of the Afghan population, their continued participation in all levels of society is of the utmost importance to the country’s forward progress and continued successes in the Decade of Transformation 2015-2024. OSCE Special Representative on Gender Issues H.E. Ambassador Melanne Verveer offered further opening remarks, reminding the participants that success in Afghanistan will not be achieved unless women fully participate in the decision-making process. H.E. 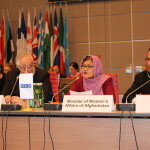 Dilbar Nazari, Minister of Women’s Affairs in Afghanistan, acted as the keynote speaker and was joined by a delegation of men and women from Afghan government, parliament, civil society and media. 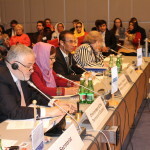 With the active participation of member and partner states, representatives of the women’s delegation from Afghanistan and Afghan civil society engaged in the discussion. Prior to the roundtable, Ms. Nazari met with H.E. Isabelle Poupart, Permanent Representative of Canada to the OSCE, who moderated the event. This afternoon the Permanent Missions of Afghanistan and the United States of America co-organized a panel discussion at the Vienna International Centre entitled: “Empowerment of Women – A Prerequisite for Development and Stability in Afghanistan”. 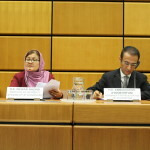 Representing Afghanistan on the panel were Minister of Women’s Affairs in Afghanistan H.E. 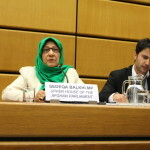 Dilbar Nazari, H.E. 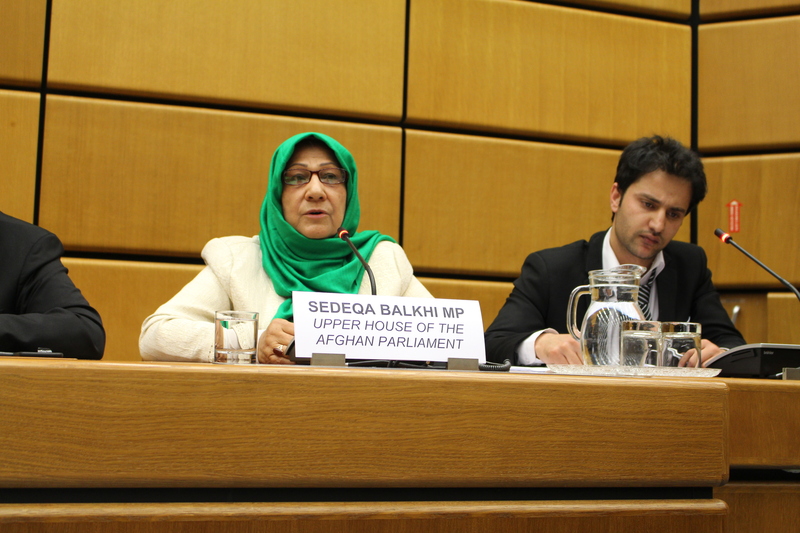 Ambassador Ayoob Erfani, and MP of the Afghan Parliament’s Upper House Ms. Sedeqa Balkhi. They were joined by Dr. Ana Lukatela of the OSCE Gender Section and Minister-Counsellor Eugene Young of the United States Embassy in Vienna. 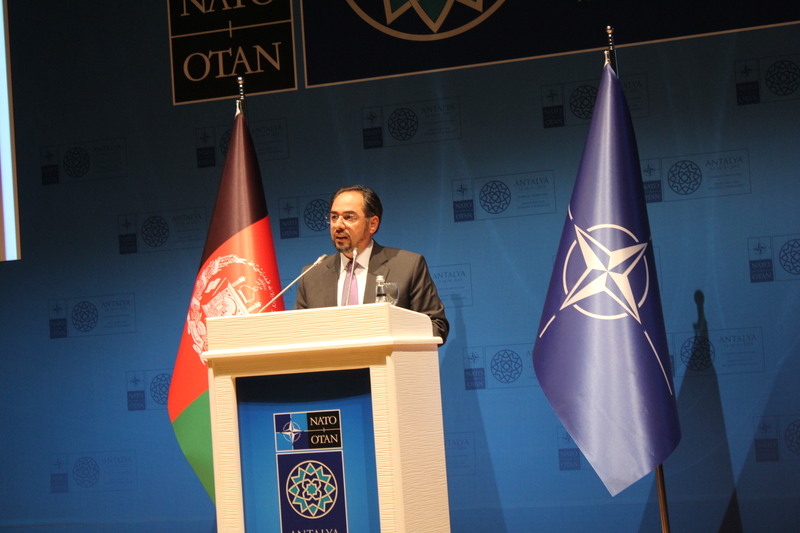 Ambassador Erfani offered opening remarks on the occasion, emphasizing the importance of women’s empowerment in Afghanistan and expressing appreciation that the United Nations will continue to stand by Afghanistan to assist in implementation of legal instruments in the area of women’s rights. He was followed by Minister Nazari who spoke on the achievements of Afghanistan over the last years as well as the challenges which the country still faces. She highlighted that women’s role in the reconciliation process must be strengthened, and outlined the red lines for negotiations in the National Unity Government, including: ensuring transparency and female participation, preserving women’s rights, sustaining achievements already made, and preserving Chapter 2 of the Constitution. MP Ms. Sedeqa Balkhi further elaborated on the subject, explaining the role of women in the Parliament and assuring the participants that women and men participate equally in both houses. The panel ended with a question and answer session moderated by Ambassador Erfani and Mr. Young. This morning H.E. 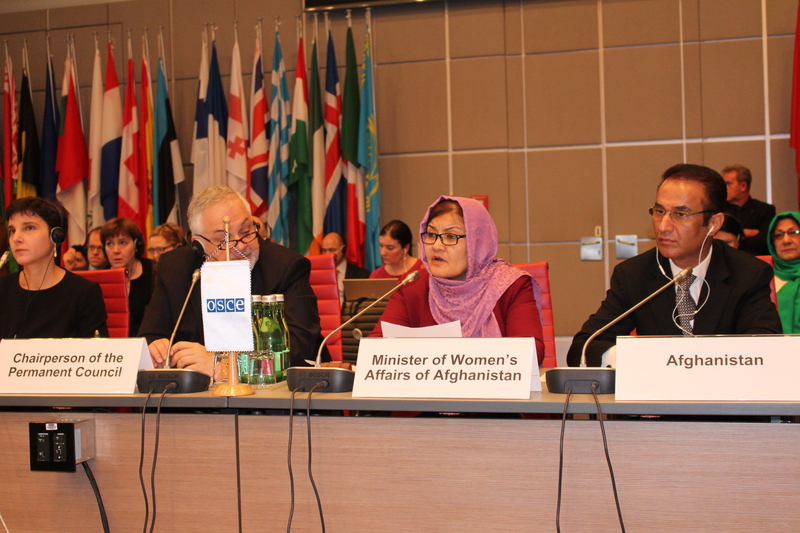 Dilbar Nazari, Minister of Women’s Affairs in Afghanistan, addressed a meeting of the OSCE Permanent Council. Speaking about the achievements in the area of women’s empowerment over the last years, the Minister highlighted legal achievements such as the passing of the Law on Elimination of Violence against Women and quota system which ensures women’s political participation, as well as societal achievements such as the increased number of women working in the health and education sectors. Ms. Nazari went on to address the challenges currently facing women in the country and to emphasize that the National Unity Government continues to make every effort to honor its international commitments towards women’s rights. By putting into place the National Action Plan for Women, Peace and Security, further efforts will be extended in order to increase the participation of women in these areas. Concluding her remarks, the Minister expressed her appreciation to Afghanistan’s international partners for their support to Afghan women. 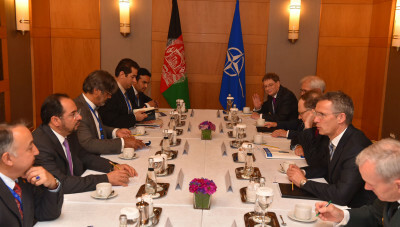 She called on continued support going forward, and stated her expectation of increased cooperation between Afghanistan and the OSCE going forward. Prior to the meeting, the Minister met with the Secretary General of the OSCE, H.E. Ambassador Lamberto Zannier. On May 10, both H.E. President Mohammad Ashraf Ghani, President, and H.E. Dr. Abdullah Abdullah, Chief Executive, met with Croatian President H.E. Kolinda Grabar-Kitarović who was in Kabul with a high level delegation, discussing – inter alia – issues such as economy, health, social and cultural affairs, as well as further expansion of bilateral relations. President Ghani highlighted Croatian cooperation toward peace and development in Afghanistan, and supporting Afghan security forces under the Resolute Support Mission. 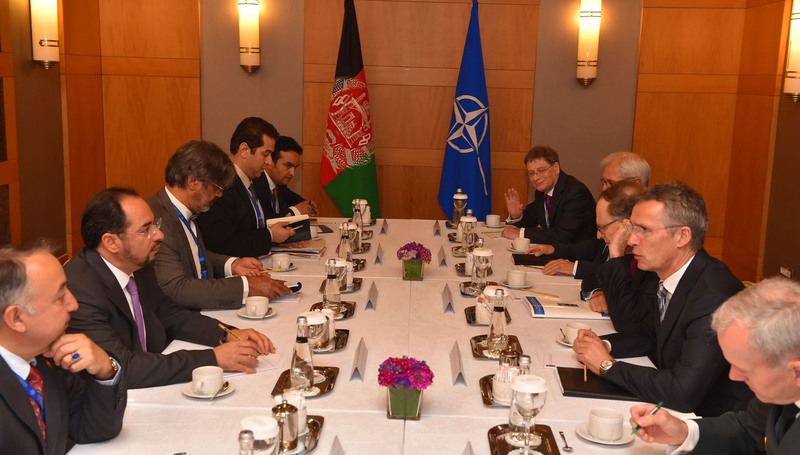 50% of Croatian international assistance has been allocated to Afghanistan, President Ghani stated. The Croatian President in her remarks called Afghanistan her second home, and commending the sacrifices of Afghan security forces and expressed her hope that these sacrifices will contribute to a prosperous and developed Afghanistan. Speaking on the friendly and historic relations between Croatia and Afghanistan, President Grabar-Kitarović stated that the Comprehensive Long-term Partnership Agreement could be signed between the two countries in the near future. Expressing full commitment to a secure, stable, prosperous and unified Afghanistan and reiterating the pledges made in Tokyo Conference, the Croatian President said that her country will continue supporting Afghanistan within the framework of the Resolute Support Mission, but also in the fields of girls and women education, vocational opportunities for women, and health. The Croatian President also met with Afghanistan’s Chief Executive, Dr. Abdullah Abdullah, who lauded the role of the Croatian troops in NATO’s Resolute Support Mission. H.E. the Chief Executive also stated that the National Unity Government is committed to use all available opportunities and to further strengthen the ties with the international allies of Afghanistan. The Embassy and Permanent Mission of Afghanistan in Vienna also covers matters related to Croatia and enjoys excellent relations with Croatian government bodies and institutions.